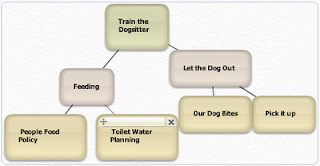 I've posted in the past about the joy of online mind mapping. The latest in this happy family is a site called bubbl.us.The beauty of those bubbliscious drag-and-drop boxes is fairly mesmerizing. I'm tempted to spend all day organizing thoughts, even those that didn't need organizing! Not only is this a handy tool for organizing information, I find it to be a fantastic brainstorming tool. In minutes I was able to generate a handful of excellent ideas, simply by sifting through what was already in my head. Sadly, the site I posted on previously - Mayomi - is now gone. As I hold a personal moment of silence, I also say a tiny prayer that Bubbl.us finds more success. Because they actually have some kind of profit generating scheme in place (selling ad space in the side bar) it sounds much more feasible. FYI: Thanks to Dumb Little Man for the heads up on this.